When the Cambridge Housing Authority recently opened the list to new applicants for Section 8 housing vouchers, they received 6,800 applications over a two week period. Few stories better illustrate the housing crisis in Cambridge so Jim Stockard pointed to this disturbing fact in his opening remarks at last night's forum on housing sponsored by the Cambridge Historical Society. Stockard, the former curator of the Loeb Fellowship at the Harvard Design School, noted that basic housing economics explain some of the quandary locally, "In Cambridge, the reason for our outrageous prices for housing is not so much that the cost [to build] housing is outrageous, though it's quite high, it's because demand and supply are out of whack. There is a seemingly infinite demand for people who want to live in Cambridge and a very very restricted ability to increase supply." The loss of general affordability, the retreat of the federal government away from the business of housing people, and failure of policy makers to act on the mandate spelled out in the 1949 federal Housing Act all came up during the hour long panel moderated by Curt Nickisch of WBUR. Cambridge housing advocate Cheryl-Ann Pizza-Zeoli and Greg Russ, the head of the Cambridge Housing Authority, filled out the panel. While Housing Authority chief Russ gave Cambridge high marks in its ability to fuse the regulatory power of the local government on issues such as zoning with the financial tools such as the Affordable Housing Trust, all the panelists shared their frustration of the city's inability to deal with the loss of of a huge portion of our population because of skyrocketing costs. Since 1990, the city has lost half of the population who might be considered "poor," those earning 50 to 80 percent of Area Median Income, a fact that leads to the "dumb bell" distribution of wealth -- only the very poor and the very rich can afford to live here, Pizza-Zeoli noted. Both Stockard and and Russ added that almost everybody receives a subsidy for housing. The greatest subsidy is not for poor people. It exists in the tax code, helping home owners through the mortgage interest deduction they can claim off their taxes. Congress is appropriating only enough money for existing vouchers so no new vouchers are being funded so there is no way to expand the program. On the public housing side, the money from the government has actually been reduced. The politics behind housing is complicated, since collectively housing is not viewed as a fundamental right. Pizza-Zeoli asked "Do we have a housing movement?" The 1949 Housing Act called for "a decent home and suitable living environment for every American 'as soon as practical.'" Stockard said that after 65 years, the wait has been too long. "Affordable housing in America," he continued "is a lottery and we have provided about enough money and your chances of prevailing in the lottery is about 1 in 4. Do we want to be a society where housing is a lottery or do we want to be a society where we believe that everybody is entitled to a decent place to live?" 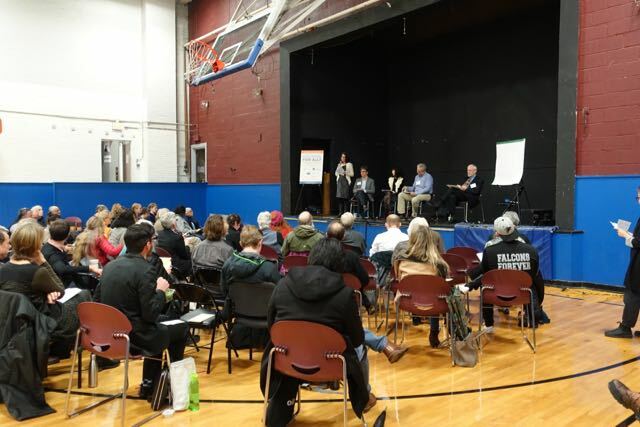 One way to address these challenges is through housing supply and both Russ and Stockard noted that in the face of neighborhood opposition in Cambridge often called NIMBYism, it is important to look at the questions of height and density in appropriate locations around the city. On the issue of density, moderator Nickisch phrased the inherent conundrum most succinctly when he asked -- In order to save the city, do we need to change the city? The very enlightening and informed discussion was taped by CCTV and will be rebroadcast. It is worth watching.